The smell of corn dogs and funnel cakes are wafting through the air in Central Iowa this week. Why you may ask? Because it’s State Fair time! The East Side of Des Moines has never smelled so good! So what do corndogs, funnel cakes, and bacon wrapped ribs on a stick have to do with babywearing? Well silly, because the State Fair is a family event! It’s 10 days of pure fried food awesomeness with your family, friends, and a butter cow! And why should babies and toddlers be left out!?! The topic on our Facebook page this past week has been about how to wear your child in the Iowa heat and how to carry your diapers, wallet, sunglasses, etc. all while eating your giant turkey leg. So here are a few suggestions we have gotten from our wonderful members. 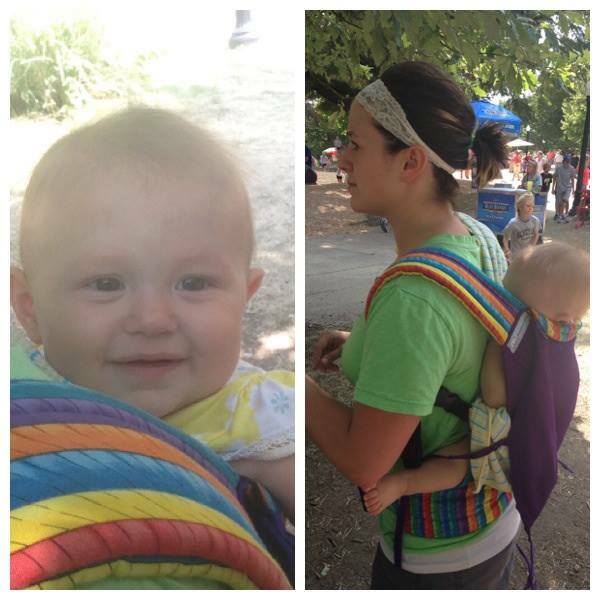 Perhaps the most popular carrier option this State Fair season has been a soft structured carrier (SSC). These are commonly referred to as “Daddy Carriers” since they are pretty simple and no fuss. A few buckles and you’re set to go. This summer we have seen some old time favorites like the original Ergo as well as the Ergo Performance. New soft structured carries are entering the market at lightening speeds and some new faves include the Pognae, Kinderpack, Tula, and Emeibaby. Angela’s little one got so cozy in the Kinderpack that she needed a little snooze. Look at those eyes! Drew is breaking hearts left and right and winning over the fair queen contestants from his seat in the Ergo Galaxy. Mei Tais are also great options for warm Iowa summers. A mei tai or an Asian (style) Baby Carrier is essentially a rectangle of fabric with 4 straps coming from the body. I love this option since it’s quick, easy, and comfortable on the front or back. My favorite thing about a Mei Tai is how compact it is–you can easily fold it up nicely (or quickly stuff it) in your diaper bag. Sarah is pictured nursing her sweet little one in a Wallypop brand Mei Tai in a previous summer. We have also had some mamas slinging their littles in ring slings. This is a great option for tinies but big kids might get too heavy with the one shoulder carry after very long. A ring sling is a great option for toddlers that want the independence of walking yet the closeness of mama for cuddles or privacy for nursing. Bobbie and her cuddle bug pose for a picture in front of the infamous butter cow. (I wasn’t lying about the butter cow!) Doesn’t Natibaby gears look great on them!?! The State Fair is also a great time to show off your finest possessions. You will see some epic acid washed jorts (jean shorts for those not current on the lingo) as well as very impressive mullets…if you think mullets are impressive. But in the babywearing world we have some serious fashionistas–both mamas and babes! A lot of mamas have opted to wear their little ones in custom carriers. We have seen some gorgeous wrap conversion mei tais (WCMT) as well as custom SSC’s this year at the fair! Heather and 9 1/2 month old Bryher are pictured here in their Nuzzle Me Creations Stay Cool Carrier. The poly mesh and internal support in the stress areas help keep them both cool and comfortable. Dana and 11 month old Mirabel are pictured in the pig barn here. But they were definitely stealing the spotlight from those piggies with their Two Momma Design Reverse Half Buckle in an Oscha Stary Night Orchid. And lastly, we have the wrappers! These are the mamas that will be receiving the bulk of the babywearing criticism and curious looks. Especially if the wearer wraps in a very crowded area. Or the child is fussy. Or wearing a cloth diaper. Or pretty much anything out of the conventional parenting norms. As most wrappers know, multiple pass carries such as front wrap cross carry or a double hammock are the most comfortable. BUT that extra fabric can get baby and mama both pretty warm very quickly. We have a couple gals that have opted to use the strap carry or the belt carry as they peruse the horse barn. A strap carry looks frightening for those not well versed in babywearing. Essential it is a rucksack carry or backpack carry without the fabric over baby’s back and tucked under the bum. It’s a great option for really hot days. Or children with medical needs that need closeness but cannot have anything too tightly against them. And lastly, we have the wrappers! These are the mamas that will be receiving the bulk of the babywearing criticism and curious looks. Especially if the wearer wraps in a very crowded area. Or the child is fussing. Or wearing a cloth diaper. Or pretty much anything out of the conventional parenting standards. Eight month 8 Emerson’s favorite place to be is cuddled close to his mama. Ashley wrapped Emerson in a front wrap cross carry and he quickly went to sleep. As most wrappers know, multiple pass carries such as front wrap cross carry or a double hammock are the most comfortable. BUT that extra fabric can get baby and mama both pretty warm very quickly. We have a couple gals that have opted to use the strap carry or the belt carry as they peruse the horse barn. A strap carry looks frightening for those not well versed in babywearing. Essentially it is a rucksack carry or backpack carry without the fabric over baby’s back and tucked under the bum. It’s a great option for really hot days. Or children with medical needs that need closeness but cannot have anything too tightly against them. Chelsea and 2 year old Preslea got some very curious looks from the strap carry. One fair goer even called Chelsea a “horrible mother.” We think quite differently and we think Chelsea and Preslea look cool and secure in Marley! We had quite the discussion on our Facebook page regarding stroller vs. babywearing. Pros and cons were voiced regarding both sides. It’s plausible that you’re wrap could get a bit of mud on it or perhaps some pineapple whip on your Obimama (Ahem, Tyler!) but on the flipside, your stroller might come out of the horse barn smelling like manure. Most babywearings chose to alternate between the stroller and a carrier for comfort of the wearer. Here’s some additional photos of our babywearers–What a great looking group of mamas and kiddos! Another great photo of Heather and Bryther in the NMC. Lisa reported she wore Lydia all day in the Tula and felt no discomfort. Here’s my little man! Fifteen month old Lucas needed to take a break from being worn to splash in the fountain. I’m still wearing the Pognae with the waist belt fastened. Making fashion statements left and right! I swear I actually WORE Lucas in the Pognae. He had a blast at Little Hands on the Farm and wanted to walk through the exhibit rather than being worn. Older siblings love to wear younger siblings–especially if they are as handsome as tree. Big sis is wearing a standard size Kinderpack here. What a good looking family! Emerson looks so happy wrapped on his mams’s back in his KoKaDi elephants. Big brother Wyatt needed a turn too! Brandy and Westyn are ready to eat some fried food on a stick in their green Ergo Performance.